L-ACOUSTICS will be at InfoComm stand C11908 with the North American debut of its new K2 line source array loudspeaker system featuring PANFLEX technology. K2The successor to L-ACOUSTICS' industry-changing V-DOSC system, K2 offers K1 performance in a rescaled package that makes it well-suited for both permanent installation and touring applications, from theatre to stadium productions. 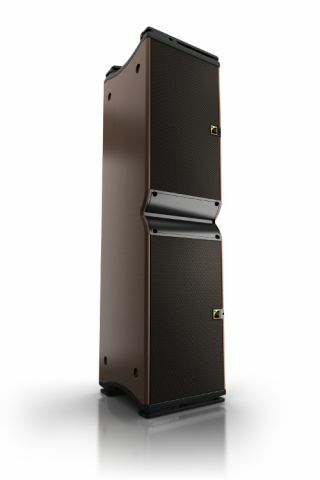 The K2 line source benefits from L-ACOUSTICS' Wavefront Sculpture Technology (WST). Inter-element angles can be set with accuracy up to a generous 10 degrees, allowing the optimization of the vertical coverage with SPL spread across the audience. K2 employs L-ACOUSTICS' new PANFLEX, a horizontal steering technology that combines mechanically adjustable fins with DSP algorithms effective from 300 Hz. Four different settings are possible: two symmetric (70 or 110 degrees) and two asymmetric (90 degrees as 35/55 or 55/35). Narrowing or widening the horizontal directivity can serve many purposes: adapt to the width of the listening area, fit long and short distance coverage/SPL requirements, reduce or extend overlapping areas, and avoid reflecting surfaces. By combining WST and PANFLEX, L-ACOUSTICS addresses the control of directivity in both vertical and horizontal planes. As a result, K2 can match the complex shape of any audience geometry with ideal sonic performance and minimum noise pollution. Because of its three-way quad-amplified design and full range capability, the K2 enclosure can be deployed as a standalone line source. For applications demanding extreme LF impact (contour mode), or maximized LF projection (throw mode), K2 can be arrayed with its dedicated and flyable K1-SB LF extension. The K2 system can also address applications with demanding infrasonic reproduction when combined to the SB28 subwoofer. Before installation, any system configurations can be acoustically and mechanically modeled with L-ACOUSTICS' SOUNDVISION 3D simulation software. For touring applications, K2 can be associated to the LA-RAK, a universal distribution platform for power, audio signals and network that facilitates cross rental between rental companies. LA-RAK houses three LA8 amplified controllers and can be flown onto a K2 array. Other applications can feature LA8 amplified controllers. For high-end installation projects, K2 can also be driven by the LA4X amplified controller. The scheme authorizes fully discrete DSP treatment per section and maximum power headroom. With its dedicated factory presets, the LA8/LA4X amplified controller constitutes a drive system for the enclosures. All L-ACOUSTICS amplified controllers feature the L-DRIVE thermal and over-excursion protection circuit.